The Mount Saint Mary Knight's defeated the Farmingdale State Rams 69-58 in their Skyline Conference game on Saturday, February 22, 2014 in the Kaplan Center in Newburgh, NY. 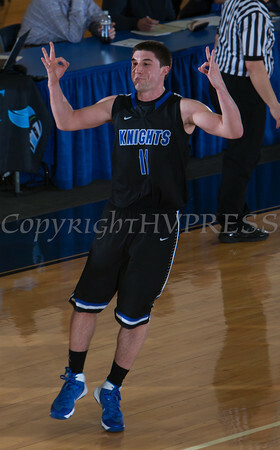 Mount Saint Mary Guard Joe Stabach (11) reacts after draining 1 of his 7 three-pointers as the Knight's defeated the Farmingdale State Rams 69-58 in their Skyline Conference game on Saturday, February 22, 2014 in the Kaplan Center in Newburgh, NY. Hudson Valley Press/CHUCK STEWART, JR.